What should you do when you arrive for a meeting and find everyone waiting outside because the door is locked? This was the situation when members arrived at the Slimbridge RBL Club on Saturday 28th March for Chairman Peter Golding's talk on Water Divining. We didn't know where to find the caretaker to let us in, and another group was using the Village Hall, so we decided to go to church! We had held meetings in Slimbridge church before, so we knew it was a suitable venue. We deposited our dues in the church wall box instead of into Dowsing Group funds. Water divining can be a ‘dry subject’, but Peter made it interesting and began by outlining simple basic procedures. He said it is pointless searching for water if the subterranean rock is not capable of storing water, and listed rocks that make good aquifers and those that don't. Fortunately, most areas of Slimbridge are on a thin layer of water-bearing gravel between layers of clay, so we had a good chance of detecting where water could be found if drilling a borehole a few metres deep. 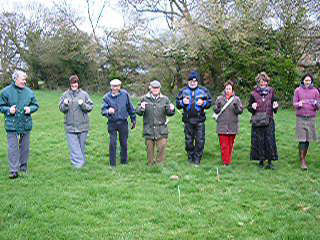 A spot of traditional English line dowsing! We then went into a nearby field and dowsed for an underground stream. We searched for second one that crossed it but at a different level, thereby doubling the chance of not merely finding water, but providing an adequate flow rate too. Most of us were able to do this and Peter confirmed our results, as he is a professional water diviner. He then demonstrated how to predict the depths of the underground streams and how many gallons per minute could be expected. There are two useful methods for predicting the depth, the Bishop’s Rule and Creyke’s Rule, whereby you walk away at right angles to the source until your dowsing rods react. That distance is equal to the depth at which water will be found. At the end of the exercise, Peter asked us to get in a line alongside him and walk together towards the underground stream where each one of us found our dowsing rods react at the same point. He suggested we call this ‘line dowsing’! To finish off the morning, Peter showed us where there was a powerful and beneficial spiral of earth energy rising from the ground. It caused our rods to rotate like a windmill, and we experienced an uplifting warm feeling: an excellent place for lovers to embrace.